A market leader in personally managing customers travel specifications, to include business accommodation and travel requirements both nationally and internationally. 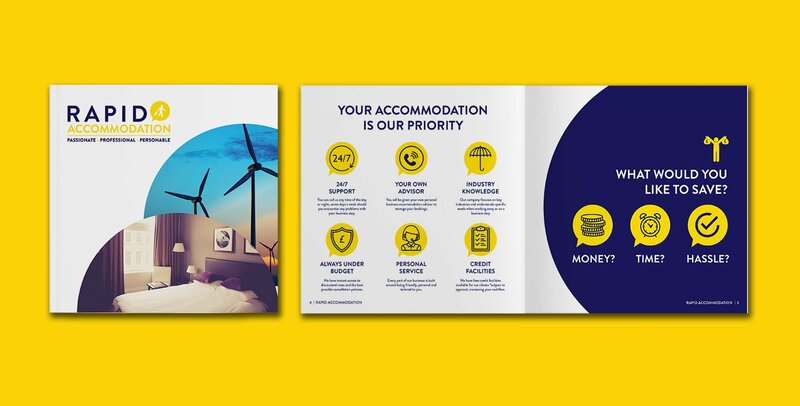 We were approached by Rapid initially to design a brochure for their accommodation sales team. Little did we know at the time that this would lead to a total re-brand launch for both there national and international business for both accommodation and travel businesses. Our relationship with Rapid was an instant success from our initial meetings. They required a design agency that could go the extra mile and we did everything we could to give them all the miles they needed. From the outset we got a feeling this company was going to grow quickly, they had an abundance of energy and enthusiasm to be the best in there market place and we were fortunate enough to tag along with some great ideas. The whole process started with looking at where they needed to be in their market place and after redefining the company’s core values, we needed to create the tools to get them there. The Travel Assistant, who is a prominent part of Rapid’s new brand and all messaging, was born out of a creative team meeting with Rapid and The Creative Agency, involving all staff and directors. This flexible assistant is simply shown as exactly that, a unisexual person who assists with everything and is there to help, which encompasses everything the Rapid brand stands for. The whole process started with looking at where they needed to be in their market place and after redefining the company’s core values, we needed to create the tools to get them there. The Travel Assistant, who is a prominent part of Rapid’s new brand and all messaging, was born out of a creative team meeting with Rapid and The Creative Agency involving all staff and directors. We were also tasked to create the Rapid brand so it would stand the test of time, not just nationally, but internationally too with Rapid Business Travel. Once the brand was approved, we then through collaboration with Rapid, came up with a strapline and wrote their mission statement. To date, we still continue to work with Rapid on a quarterly basis scheduling and writing all there social media content as well as producing brochures and exhibition displays.